By long on the bonds, I mean long dated and being 25 years plus. In the QE i was first Treasuries then even longer treasuries they purchased then a lot of mortgage backed swamp paper even longer dated 30 years or so .... they have. Just read the previous few posts and have to laugh ... at cycles and how times change ... TLS loved it at $2.80 for the NBN deal and yield ... sold it at too low ... a price ... well below the highs but did enjoy years of that 10% plus dividend and franking credit taking it into absurd levels ... now ... well back to square one again. Not quite but funny they sold their copper network ... and NBN is, well what it is ... I get 4g at 50 MBS and NBN at half that if it works ... which it doesn't even exist in the country town I live in. Banks, well ... used as the personal piggy bank of the govt for tax of late, bashed senseless for ... years being naughty but sometimes for making money ... we are NOT back to the $20- for ANZ and so on I loved 2011-13/14 ... but not that far away. USA on the other hand, well its a mere 150% of our markets performance last 5 years. Nothing like giving the needy a tax break !! The corporates .... and as to their accounting, over 50% use, well ... methods not accepted outside of Zimbabwe. Our market went up less, and for once, should fall less. Despite the noise, some serious things going on globally and as per normal, when our new PM met the DONALD and he had his German translator there, because after all we are Austria, these rumblings via 99% of the rest of the world the USA is oblivious to. In this, nothing unusual, but, just more of the same. I suspect, the damage is permanent and serious. Then again, Apple seems to think $2,000 for a phone is ok when Huwai makes one not that far apart for $400- and I see a great LG one at $299= with double the battery life . Our Tax office has done a great job and the only reason in 2020 we will hit a surplus is via .... making some of these tonks pay tax, they have got about 30% of it .... an at best ... result is say 60-70% and the proposed tax on turnover for the likes of Google and Facepoop and others should have them more spooked than they are. then again we are only 5% of the market. China whilst no silly Facepoo, actually has social credits and reading their media the tone is, well, as expected bad. how things change ... and not. With most things, there is a release valve and its HUMANS and the USA official life expectancy fell by 0.1 of a year AGAIN as EU went UP 0.1 of a year again. Officially its at 78.6 years, but with most propaganda states like Zimbabwe and post 2000 USA statistics the methodology when examined is absurd and deliberately so. Even so, even the official numbers are chilling and with healthcare hitting 20% of GDP and effectively only sub 90% have cover, it is what it is ... the worlds largest genocide or in this case democide. Not a debate about the cause and effect of income and wealth verses length of life, but in 2019 will go into great detail on these and other things which are driving markets of late. Back to the USA fed, as I suspected late 2013, the break even on the bonds was around 3% and they were very long ... the 3 trillion of them on the USA feds books. As of end of Sept 2018, the USA fed released an actual mark to market and it was MINUS 66 billion. Its NOT 2013 and the spread between 10 year and 30 year bonds back then was 1% not the 0.3% we see now. Either way, an aside, if things were to go to the near 1% level, of course the implied loss would be awful, 300 billion as it was late 2013 ... or in a crisis bond wise if the spread went further ... even worse. for now, not like most things likely until overnight it occurs. Other side, USA deficit is nuts and treasury itself issuing bonds like used toilet paper ... and into this the USA fed is trying to sell ? Yellen as she left, asked by congress how the selling was going ... she lied and said well .... when NONE at that stage had been sold. they have reduced the size of the balance sheet post QE easing ... as expected, BUT ... BUT ... always a BUT /// the mortgage bonds on the books, the very long ones the Fed owns, seem to me NOT to be behaving as usual ones do and I might have expected 20% MORE to have naturally evaporated. Of course the answer for this, might take 20 years to find out WHAT actual bonds they own and WHY they are not maturing early as these things tend to. Then again what the hell do I know !! Interesting times. For me, for now, I will sit and watch the markets. At some stage the last place I want to be is in cash. The USA federal reserve in March 2014 has confirmed its intention to run these 3.3 trillion bond assets till maturity. It intends NOT to revalue them and intends to NOT do anything other than fund them for the lowest possible rate forever. All of this hinges on one thing, how long does it take the global markets to work out that fiscally USA is not ready in any way for its aging population and cannot fund its promises ? When do people accept eventually they will be getting a haircut on USA treasuries if nothing is done ? Its strange and amusing, and sad, USA Budget this year appears to be getting better. It is. USA Federal reserve by NOT marking to market and just amortising the bonds, ignoring that if marked to market they would lose 330-350 billion for the 2013 spike in bond rates, instead of that, the USA now able to fund them at 0.25% vs interest rates of 3% on most of the bonds was able to send the USA Treasury 79 billion in profits this year and IGNORE the losses of 330-350 billion if marked to market. I am sure this may actually keep things alive for another few months. The Deficit as a result is LOWER than expected. I am left wondering if China or Japan or OPEC who funds this debt and funds the US federal reserves bond and asset buying program is happy about the fact that the USA government is booking 80 billion in profit a year ? And conversely paying them 1.4% overall on the debt of 17.5 trillion. Not even that, if one takes the PROFIT of 80 billion off the total interest cost of $250 billion, thatÃ¢â‚¬â„¢s leaves the USA paying $170- billion net interest on 17.5 trillion in debt. ThatÃ¢â‚¬â„¢s 0.97% an astounding number. But NO it actually gets worse than that. You forgot the US federal reserve has 3.3 trillion MORE of bonds and it pays just 0.25% interest as required on these debts. So thatÃ¢â‚¬â„¢s a mere 8.25 billion the USA federal reserve pays for the 3.3 trillion more. So the sum total is 20.8 trillion debt, or 122% of GDP the USA gets to fund at a total NET cost of 178.25 billion in interest and that equates to a loan at 0.8569%. Talk about a great deal, or a nightmare waiting to happen> that is if you know anything about RISK. Inflation at 1.8%, actual cost of living as per normal is 0.75-1% higher than that, but USA gets to borrow for 122% of GDP at 1% BELOW inflation. Maybe the US fed could buy all treasuries not just the 3.3 trillion but all of them and fund the whole debt at 0.25% ? wouldn't that be neat !! I talked about assets being allocated incorrectly to junk bond people being able to borrow at 5%, I honestly have never seen, or heard of anything like this. We plan to have a deficit of 30% of GDP in 2030, but must not mention it. In 2014, we have magically made our budget appear ok because the USA central bank which lost 330-350 billion on a bond position in 2013 is Not going to mark to market but expects China and Japan and OPEC to fund at 0.25% for 30 years on 3.3 trillion, so doing this, we at the USA federal reserve can ignore the very real loss, declare a profit, hand the profit to USA treasury who will then declare a lowering of the USA budget deficit as a result and for now the problem is swept further under the carpet. Must not speak about this of course. Obama will not invite me over for ribs. Likely he means my ribs !! Strange strange world. Eventually people do catch on. The elderly are real. The costs are real, the loss, well I would have said its real and thought it wise, not to declare a paper profit and just amortise the value of the bonds upwards rather than pass one fake bit of paper to another side of the government and hey presto the deficit is reduced by 15% this year !! It's like that trick they pulled in 2013 where one day the GDP of the USA was 16.1 trillion and the next it was 17 trillion. Nothing better when your dent was approaching 110% of GDP to produce 5% more GDP out of thin air. This is what the house of cards is built upon. Am I being politically incorrect mentioning it ? Do I care. I am a nobody to them. If you wish to ignore a loss of 330 billion and declare a profit of 80 billion, your making one hell of an assumption. I now understand what Jack Lew said when they had made some progress on the budget. They decided to take 80 billion there and add 5% to the total GDP of the USA there and all is apples. Will anyone notice ? Or actually react ? Or even care ? Or will the rally resume until it hits the sun and turns to cinders ? Honestly, if the Chinese and Japan and others are willing to lend at negative rates below inflation, with no premium for RISK, or TIME, or even INFLATION and watch their real money evaporate in every sense, that is not something I can predict when it will change. It is NEW territory, does the demographic train hit first, or will this stalemate continue for another 12-24 months ? The asset prices are there at 200% of value, the debt is what it is. The risks are what they are, and the outlook is also cast in stone. I choose NOT to get involved in any of it. I choose NOT to own assets that rarely trade at 200% of value but here we are. I choose NOT to lend to the USA at below inflation. I choose to accept an OK deal to earn 4-5% on my money and sit out of this mess. Whilst I could I suppose have hung onto my pet Telstra or the others, the deal was great at $2.80 and over 10% with franking credits 14% and a whole group of companies paying around 10%. Now in 2014, at 5.5% yield and still the franking credits, for some attractive for me, far less so. PS end of thread ... USA is going to get China to fund this debt for 30 years. 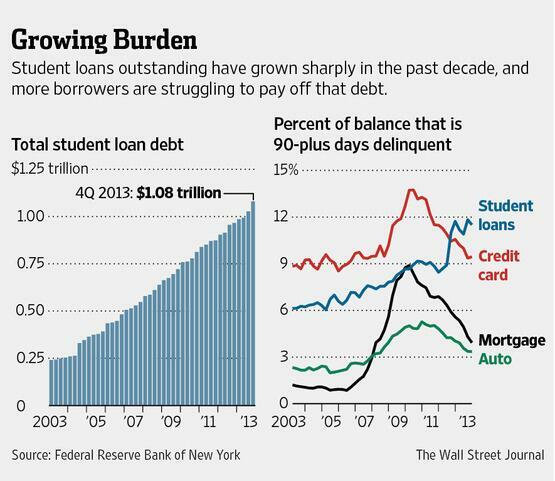 Student loans always a mess in the USA. Some parts of our own the same but the goverment has the ability over time to recover MOST of them. The other agency debt, the Goverment taking over the home loan side is a bit more of a worry for me. the number of loans depending on who's numbers one uses are still 18% of the home loans with negative equity. this is despite 9 major cities hitting all time highs post GFC for house prices. Some are still very close to the old very silly highs. San Fran the worst offender as usual with the Google people paying whatever for a house there. I am still actually awaiting the official FED report, its LATE both the quarterly and YEARLY one. I am only presuming they DO NOT decalre the 330-350 billion losses on their QE Bond Position in 2013. It is interesting the report I asked and was told in the closing days of Feb is NOT out even early March. Since their accounts have been adjusted retrospectively and the Capital seems to be frozen at 55 billion, they have declared it as far as I am concerned they run their 3.3 trillion in bonds till maturity and expect the people to fund it at zero percents. Since 48% of this funding comes from overseas and will Rise as the USA adds over 6 trillion MORE debt to the pile by 2020, the only question is ? when does one of the overseas lenders spit their dummy when they wake up to the fact the USA federal reserve or USA treasury ... same thing .... since all profits and losses go there anyhow, but what do they do when they know they will get nothing for 30 years of lending ? Its like the stupid plan Yellen muttered about negative rates. My view was if Yellen did it I would take my money and put it under a pillow. I am not going to be charged for having cash on deposit when inflation is near 2%. If Yellen turned up on my doorstep because her broom had broken, demanded $50- , to borrow my car and promise to return it with an empty tank, and dented, i would set the dog or the hose on her. I await their annual report. so too do some others waiting to see if the US Federal reserve tells China it just nationalized all FX reserve it held with the USA ? Strange world. Some of the USA media I am sure will wonder where the US feds annual report went along with the quarterlies and if they have old copies vs the new ones .... what happened to mark to market ? Should be a fun 10 days. Likely pass without a murmur, but like pulling the plug out of the bath .... it will be fun. here's something with no opinion.....actual numbers that speak.....or yell....or...scream....lulz! Yes Plunge protection team is alive and well. One member there since they were reactivated in January 2008 PRE GFC ... the market was not even 5% off its highs came out in 2013 but has since been convinced NOT to release her book. Have not checked if its going to be released. Just checked she is silenced .... sadly. My own ? Well ... I have spent a lot of time and effort ... the last 5 chapters ... its like I said ... WHATEVER. not to you or others, its just the futility of it I find myself going whatever. US fed has NO interest in marking to market. In my travels this last chapter ... in 2002 the treasury secretary objected to the tax cuts, correctly identified a gaping hole in the budget of 500 billion ... and O'neill was sacked. In 2012 the BLS person who took over from the person who adjusted inflation OUT of CPI pre GFC 2002-2007 if you can believe that, adjusted unemployment UP pre GFc when it got tight, came out in 2012 and said he thought USA unemployment was 3% higher than he was reporting ... he was ushered out the door ... his name was Hall i think. She stopped saying anything ... her book disappeared from being published. But yes she was there up till the end. If you go to her bio now .... its been removed that she ever was there the PPT, her planned book gone ... basically with most institutions and ones I work for have 7 year deeds of non disclosure ... hers was likely 20 years. Do I believe its still going ? well does it matter ? Did it matter in 2008 ? I mentioned it, knowing it was operating and when it started it made the eventual trip to the lows of 2009 no different and if anything worse. I said in 2008 there are some things you never do ... they did most of them despite that, so late 2008 ... I was going yep Australasia close to the low it bounced massively ... but I knew USA was NOT at its lows ... not until it showed fear and showed some respect for risk. So I exited into 2009 and awaited what happened eventually in 2009. I suppose what i am saying is ... even the plunge protection team if operating is really a matter of me going in 2014 ..WHATEVER. this time around .... they lack the tools to do anything other than curse. These ones ? It really does not matter, not a little bit ,,,, not a tiny bit what they do. Whilst i cynically say China may as well just giove the USA the 3.8 trillion ... sadly I suspect to be honest it will save a bit of time but will make NO difference to the eventual outcome. USA promises the same benefits to its over 65's as others, but taxes at less than half. So when i go whatever ... I couldn't care if they got Obama in a monkey suit with a sign going lend to me ... the outcome will still be the same. Whilst not many will see the US fed just going gee you silly lenders we are going to run this bond position that's turned sour for the next 30 years and YOU .... SUCKERS can pay zero percent for it. Market just goes .... yawn. Its marching to the other tune, the chicken dance song and ... the usual rah rah rah USA USA USA chant. I expect unemployment to fall to 6% and below ... I expect participation rate at 30 year low to fall further. It should fall and via the elderly 0.3% this year, thats it. THE USA adjusted it in 2013 by what ? Having read my 1,500 pages from 1998-2001 on another site ... and a lot more, 2,500 pages from 2007-2009 ... some of the things I said then were scary ... and very accurate, but its a WHATEVER in a bull market. A bull market does not make one a genius, actually far from it. Even the Chimp smearing his own byproducts on a stock newspaper to pick what stocks to go long will likely make money in a bull market. the Chimp will likely outperform all experts they have. Do I bother with chapter 6 ? Well its either I just put up and shut up to these people ... and by that I mean the whole lot and just call them liars ... and actually poke fun at some of the economists or newsletter sellers and take them on and basically shame them or just go .... OK I know where its going. I have protected my universe ... and my family and that is all that matters. Sorry that's my dummy spit. So sharing chapter 6 ... it needs work ... my models ... are my own ... deeper I go into explaining the inter relationship between them ... the more difficult it gets. I am also annoyed not being as accurate as I was in the past, this time ... not an excuse but very different. We are not facing a severe correction but a calamity. goverment still stimulating .... USA side. Strange thing is ... I got almost to the day ... in fact I think within 24 hours the USA high in 2007 and me going on the thread on this site I am now 90% cash and then on and on I droned ... talking like an idiot about a 4,000- market when it was 6,850-.
this time ... I wish i was wrong, I really did and still do. Only the mentally ill can have 100% conviction in their predictions about the future ... then again in 2000 and 2007 i missed the day the market in the USA peaked ... in writing by less than 72 hours in total .... this time ... my frustration with this magical act ... not about being wrong ... I just find it illogical to be able to see the scope of the problem in 2014 at 150% of what it was in 2007 and ... the market will just keep merrily going up and up. I don't mind that being wrong ... this time you have people making very soothing and convincing noises ... USA Fed just convinced them. What I suppose amazes me, it does every time. its my fourth law of investing. And here I am getting frustrated and annoyed by it. that is STUPIDITY ... here I am breaking it. Asked in 2007 why if I was convinced it went down i didn't go short ? I said never underestimate idiots. Here i am in 2014, getting frustrated because I am underestimating the stupidity of the average USA investor and the average person financing the USA debt form overseas and in this I include China, japan and OPEC amongst many others. As always if China And Japan wish to lend to the USA all their foreign reserves at zero percent for 30 years to fund a fiscal hole that is being denied, its like looking at a new TV show ... who is stupider !! US media, US politicians, USA fund managers, Overseas investors or quite possibly me. I could be very wrong !! Will you be releasing the last paper? Do you know if the plunge protection team are still active? Elsewhere I have seen a very interesting chart linking the feds cash injections through POMO to the rise of the stockmarket. This month the feds pomo schedule by my calculations 34.5 billion total . Whatever Ã¢â‚¬Â¦. like a sullen teenager I say this. Having spent the last 6 weeks looking over events 2002-2007 and now able to prove how CPI was understated at one stage by 5% pre GFC and unemployment, very tight PRE GFC at 4.3% low was altered from it being shown it was LIKELY under 3% AT some stage pre GFC Ã¢â‚¬Â¦ both which would have caused any other central banks to raise rates 3-4-5% above what they did. The US federal reserve and system just swept that event under the carpet and went and acted surprised when the GFC came along. WHATEVER Ã¢â‚¬Â¦. it has taken me 250 pages to provide links and to show how it was done, but who cares ? The people who owned indexed bonds to the USA CPI were ripped off 15% over 5 years 2003-2007 by this understating of CPI. People expecting pensions linked to CPI and indexed, also got ripped off. In some ways needed to deaden the blow of what's coming but for those who retired in 1980 they had a fantastic Social Security income vs those coming post 2015. Again its a WHATEVER. People do not care about past history, I do, but only to be able to see what is going on right NOW. Chapter 6 or a whole new book needs a lot of work. Its sad and to know how they did it then, and then to what is going on now, the picture is grim. I have actually read all my comments from 1999 and 2000 and 2007-2009, they make interesting reading ... but again WHATEVER. Since I now read articles being cut and pasted and a classic in the FT about how junk bonds now do not relect risk ... its again whatever. Meanwhile we hit new highs ... or the USA does. Australia still has that gap and 50% below USA and UK and German equities, maybe some of it closes .... a bit in 2014 but even this i find had. I have sadly reached a conclusion. last time it was a nuclear event I talked about the 40-65% correction. Things being bombed back to glass and how it got there. having spent 24 months and a lot of time, money and effort on systems for myself ... and to make the next 30 years easier. Rather than boor people with 270 pages of reasoning .... the ELE event ... the once in 100 year correction ... the 65-90% fall in equity prices .... ones that occur well but once normally in 150 years .... last one for the USA was 1929. NASDAQ and its 88% loss was on a specialty index. Oh and prior to you scoffing China had one post GFC .... its peak I laughed about the 6,000- and its low ? the Nikkei in 1990 ... well its low ... we all know was not a good one in 2009. But I am proud to announce after having my own results audited ... twice ... the chances of a Massive correction in the ELE region is now over 61.4% . yawn .... its like that in a rising market. Everyone is a genius ... even the chimp smearing its poo on a stock chart for your selections is beating the market. This ELE chance is normally under 5%, it rises , each year post 2014, by 5%. In very short when your declaring a budget deficit reducing at 100 billion and the contingent unfunded liabilities are rising at 5.2 trillion in 2014 or a rate 50 time that and the ACTUAL impact of these liabilities are HERE .... in 2014 ... baby boomers born in 1949 step on down as you turn 65 .... this rises 5% each year out to 2020. By then its assured. Its basically assured now, Obama a great orator but hopeless at math. How can anoyone who is not an idiot look at the 2018 budget and the corporate tax extimate of income and not go, compared to 2014 thats 87% higher and 76% higher over infaltion ? Or do the same with income tax 30% over inflation ? Or go to the expnese side and question the actual numebrs let alone the totals of thos eover the age of 65. USA with the longests and biggest babay boom from 1948-64, in 2014 has the smalles timapct on budgets of any nation. the lowest percenateg of those over the age of 65 in any nation OECD developed ones that is in 2040 when in reality USA had the biggest baby boom of any nation both longer and stronger, yet the budgets have it all removed. I go Whatever. Sadly whatever. Since like in 2007 the same players are either there or pulling the strings, I suggest that the likely stopping point eventually will be in the 80-90% loss of capital region. Hopefully it does not take like Japan 20 years to get there. On another note. the US fed declared it will NOT mark to market its bonds. It has suspended its mark to market and since there are only two reasons for this, one is an illiquid market .... or the other .. an intention to hold bonds until maturity. I am proud to announce the USA Federal reserve has frozen its capaitla levesl at 55 billion. It will not be decalring the 330-350 billion it lost on bonds in 2013 if they were marked to market. Since 2.3 trillion of these bonds have 30 years Maturity the USA federal reserve has announced to China it expects them to fund the USA federal resevres postiion which is in fact owned by the USA treasury and fund it at zero percent till 2044. China may be better just to hand over its 3.89 trillion in FX reserves right now in 2014 and save 30 years of being paid nothing for them. All of this a whatever as the market rises to new highs. It is frustration that massive moves to the goal posts such as the USA Federal reserve openly declaring war on everyone and its intention to fund the 4.3 trillion balance sheet at zero percent forever is going to occur. Honestly if I was Chinese, I would buy other currencies, metals, even multinationals. Whilst overvalued at 200% of value, its much better than losing 75% by funding it for 30 years. Must go actually confirm this, I noticed over the weekend despite one report during 2013 showing reserves had slipped to a mere 36 billion and that was prior to the awful bond yield rises late 2013, the USA federal reserve had adopted NO revaluation policy and there are only two reasons for that, one is an illiquid market ... which is not possible when the US fed itself is buying everything in sight ... or was ... or the unannounced intention to make lenders lend at zero percent for 30 years. So instead of mark to market its just amortized over the 30 years. So the USA on top of its 17.3 trillion debt, the 11 trillion in agency debt it underwrites, its now added another 4.1 trillion of bond positions that went wrong to funding needs. I think I missed that memo !! Market goes WHATEVER .... my RISK model goes #$^@#$^#$^ as does anyone else s .. Obama gives a good speech he practiced in the mirror for hours about changes which will never occur and the market ignores it all rises to a new high. Is it a big think the USA just declared a need to fund another 4.2 trillion for 30 years or not ? the USA federal reserve has clearly suspended mark to market of Bonds and frozen its capital at 55 billion. If one takes the money being borrowed from social security and pensions and the debt at near 13 trillion adding another 4.3 trillion to be funded, at zero please ... for the next 30 years, is the bond market going to react well longer term or not to this ? Maybe they will not react. But by 2018 with another 6 trillion in debt will they react ? Or by 2020 with 8 trillion ? Whatever is all i can say. Never seen anything like it even pre GFC. ELE ... NOT Nuclear this time ... not 40-65% falls this time this round ... the arrogance of this cabal of nitwits knows no bounds so its 65-90%. Imagine sneaking in buried in the USA Federal reserves reports the fact we wish you ... the funders of our debt to accept zero percent for the next 30 years. WHATEVER .... the market is going to the moon. I am a genius ... I made money when its going up. Catch you on the way back down, where it peaks ? I really dont know. this was a serious if not earth shattering in your face announcment and declaration by a borrower to go nope ... we intend NOT to issue long bonds to fund it, which even when the US treasury issued the US fed purchased more ... the USA Fed will borrow 4 trillion at zero for 30 years. So maybe if the Chinese just hand over their FX reserves NOW it may delay the start of this correction till 2022. Thats how big the holes get, a hole in 2030 that is the actual size of all the Chinese FX reserves in 2014. Market Yawns, goes WHATEVER ... and rises. Me, I do so too. resigned to watch with a weird fascintaion. I did so early 2008 on the rally that all was safe. Some of my comments during that rise, I rode it up for a bit, Knowing if you make it illegal to short banks they will rally, but it doesn't change the fact as I said in January 2008 about Citibank by late 2008, Citi without a direct injection of 300 billion, without virtually unlimited funding it was broke vai any definition of the word pre GFC, and COO of that company in 2008, jack Lew is the USA treasury secretary in 2014 ? A man who openly admits not much knowledge about risk ? WHATEVER .... I watch with that morbid knowledge of what is about to occur. Maybe delusional but in 2000, 2007,2008 even 2009 ... I wish i was wrong ... but since I just had a very good team of statisticians and actuaries go over my models to make sure ... I honestly do hope I am wrong. NOT true ... other than the US fed not revaluing or declaring any loss .... it intends to run these bonds till maturity !! The short version at least. Yellen is stamping her dictatorship upon the market. She was behind the QE and its most voracious supporter. Economic warfare has been declared upon the investment markets and anything will be said, factual or not to support the myth that QE works and Yellen and Bernanke are not just the damm fools they are. The series of papers the US fed did about the participation rate were NOT FACTUAL and just the opening shot as the Queen Borg takes over. It is sad, it is scary. The market will react as always to what they are told. With the pathetic level of research the USA markets are reduced to its going to be some time till they wake up and go surprise .... we didn't see that coming. They did, there are quite a few out there actually brilliant people questioning this QE and the whole policy, but inside an institution it impossible to NOT tow the line. The latest, this snow flurry of paper, is really an aside. Nice to Steve Forbes printing something other than puff. He is correct the US feds losses do not matter. US treasury and LEW basically owns the positions on the US feds books. The US fed has paid 400 billion to the US treasury it will now take some back. I do wonder about this mini scare in overseas markets and if it was designed to get the run back to mummy and US bonds. they had their biggest rally in a very long time as a result. All this is fine, for me its the opening dances we had in 2008 and they just spent their best tricks already. It will take some considerable time for the dim witted USA financial markets to react. I am surprised at how stupid the Chinese are being. I gave them more credit. EU makes a few noises but like always is acting like the USA's servant. One thing always bugged me with whomever was the Australian president, is why they let people like John Howard or Kevin or Julia be their public face. Sorry cruel and not true, but the game she is a changing. Why I say this is the series of papers the US fed produced were basically to cover up the disgraceful LACK of progress they have had on the employment front. The USA in its arrogance produces and publishes something which is clearly fictional for the investment markets consumption ? THe USA Federal reserve, that's the central bank of the world. It was NO mistake these conclusions were made buried under a pile of reasonable sounding conclusions ... BUT THEY WERE FACTUALLY INCORRECT. That a goverment and its central bank does this, produces a set of lies, or being nice things that are NOT FACTS and submits them as facts is called ECONOMIC WARFARE. It was designed to make the USA smell good and everyone else like old cow patties. Well enough .... I say enough. I say enough on behalf of the 47 million in the USA on food stamps that 15% of their population. That's an increase of 30 million since Obama took office. I say it for 14 million NOT counted in the workforce and REMOVED totally. I say it for the 100 million about to retire in the next 25 years and the fact they have saved NOTHING for their retirement. It costs $40,000- a year to pay the medicals and a retirment income for a 75 year old. This increase of 60 million from the 2010 number is lost in the USA budgets. It will increase outlays by 2.4 trillion or 15% of GDP !! INCREASE .... when the goverment is only taking in that amount in taxes and HALF that in social security ... this game frankly will last not a hell of a long time. In the meantime the Penguin has declared war on investors ? How dare she. It is a disgrace and time to take some action. I threatened in 2009 to write a book .... and give it away ... you may note in 2013/2013 I called it a play but its ending up as a book. I love so many beautiful Americans, kind and generous to a fault. Knowing some I lived many years with, are in those number sof lost and missing saddens me. That the elderly are going to be abandoned ... JANET it 67 and she should be actually on their side. It is time for me to not be nice, be the rude person 30 years in markets has made me. I am not rude, or aggressive at all, but I will stand my ground if needs be. Janet and the economic cabal needs someone to pull them up. Be afraid Penguin, if someone stoops to these lows, expect people to come back and question these tactics. In the meantime, the market will do what it must. I note with astonishment there was a massive flurry of earning estimate downgrades late December 2013, big ones, so with the now revised earnings estimates that bore NO relationship to the ones at the start of December 2013 ... they have declared most companies beat market estimates. Are people really that mindless in 2014 ? the estimates at the beginning of 2013 via brokers vs the end of year ones showed the largest gap seen in many years as they were downgraded during the year. Normally this occurs, just in 2013 it was even worse. But for now I will try and get out a shorter version of my response to the Penguin today. Its nice to have it openly declared as opposed to Paulson and his actions of 2007-08-09 and he calling the GFC over in 2007 before it started and then 5 times more prior to March 2009 when it was finished. Janet cannot admit she is wrong. She has been a professor with tenure for so long and no one questions the professor. They cant be sacked and have jobs for life !! Sadly this cycle has a very short life. I hope this correction starts sooner rather than latter because as this goes on the underlying fiscal side of the USA crumbles further. Can just hear the screams on increase in tax rates. Now what was that drop in participation rate caused by? Oh YEAH... retirees. ... talk about being caught b/w a rock & hard place. "There is no present or future-only the past, happening over and over again-now"